Here is a card that I put toegther tonight. If you cant tell, I have micro beads all around Emmybella. 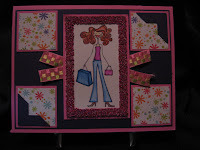 I have so much ribbon in my ribbon drawer I decided to add some to this card. The colors are so darn cute. Pink,yellow and a lime green. Let me know what you think of her! Here is my entry into Beates Weekend Sketch Challenge #52. These challenges are so much fun because you get thos creative juices flowin. 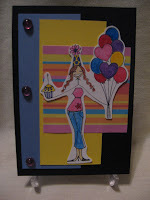 I used Stamping Bella's Partygirlabella I get into ruts as to what to put together and these help me tremendously! Go and check out her blog and try a challenge or 2! Happy stampin all! Here are 2 cards that I made for swaps that I am in! 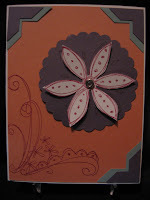 All supplies used on these are Stampin Up! Pretty simple, pretty basic. The one on the left I used my Embossing folder on the white, The stamp set I used was taggers dozen and Pink flower eyelets. The one on the right I used "Doodle this" and my photo corner punch. I just love that punch! I added a jewel brad in the middle of the flower. I cant wait to see the cards I get back, I will be sure to post them when I do get them!All for now but I will be back soon to add some more goodies! 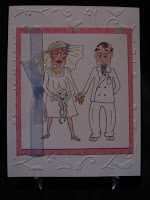 Here is a card that my great friend Christina sent me. Christina finds some of the most coolest stamps. Isnt this couple adorable(LOL) Craig and I are getting married on June 27, 2009 and Christina sent us this card, I guess this will be us when we renue our vows in 30 years! I made this card for Brandon's dad for fathers day. 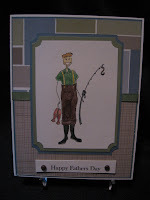 He loves to fish and this was the best stamp that I had for any kind of a fathers day card. Fishafella from Stamping Bella. I also had no "Happy Fathers Day" stamp so I had to print this out on the computer but I think it looks pretty good! I used Bucharoo blue,whisper white and garden green cardstock and the patterned paper is a 2 sided paper so I didnt have to worry about coordinating 2 different papers. I put on a green ribbon from SU! and added 2 brown brads, I also used crystal effects to the boots to make them look like rubber boots, that I thought was a really cool idea, and there you have it, A fathers day card! TFL!